Today, I had to get a short 5 miler in on the way home after a meeting in Murray Hill. Home is the Bronx, so I was trying to get into the Upper East Side to catch my Express Bus. So, here is where I went. 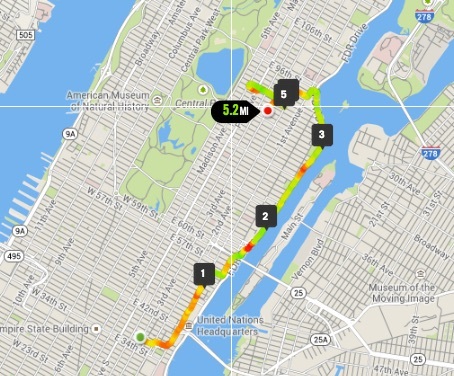 (Run 4/1/15) That’s a start at 34th and Lex over to 1st Ave, north to the Queensboro Bridge where I jump on the East River path up to 96 with a 1 mile scramble around the UES to get to 5 miles. Started around 8pm. About 5.4 miles, if you can get your GPS watch to connect at the start of the run. That’s Cigarette-smokers Per Mile Run. I counted 6 over this 5.4 mile run for a CPMR of 1.11. Actually kinda noticeable considering many other routes I run in Manhattan are well under 1. Mostly run in Manhattan so safe until about 10pm imho. Not too much to deal with except for Murray Hill and the UES below 90th. Sidewalks in the City and cinderblock on the East River. Not really. There is a little park on 87th east of 3rd Ave for a quick shirt change. Jack Rabbits is also on Lexington between 84th and 85th. You can use their dressing rooms before closing time around 8pm. Actually, yes once you get out of Murray Hill and onto 1st Ave/East River Path. Yes, the East River and UES above 88th offer fairly stress-free running. © 2015 Danilo Torres. All rights reserved. This blog and all posts contained therein represent the opinions of Danilo Torres (hereafter referred to as the “author”). By using RunningRoutesReview.wordpress.com, including any services, products, software and content contained therein, you agree that use of the Service is entirely at your own risk. The information found on this blog is intended for entertainment purposes only. Any statements made that imply that the reader should engage in illegal activity are made in jest and should be ignored. To reiterate, at all times, the author advocates that you obey all street and traffic laws during any of your runs. The author assumes no responsibility or liability for any injury, physical or otherwise, suffered as a result of information gleaned from this blog. The author does not grant to you a license to any content, features or materials you may access on this Website. You may not download or save a copy of any of the content or screens except as otherwise provided in these Terms and Conditions, for any purpose. You may, however, print a copy of the information on this Website solely for your personal use or records. If you make other use of this Website, except as otherwise provided above, you may violate copyright and other laws of the United States, other countries, as well as APPLICABLE state laws and may be subject to liability for such unauthorized use. The author does not grant any license or other authorization to any user of its trademarks, registered trademarks, service marks, other copyrightable material or any other intellectual property, by including them on this Website. User acknowledges that content, including but not limited to text, software, music, sound, photographs, video, graphics or other material contained in either sponsor advertisements or email-distributed, commercially produced information presented to User by the author or its Advertisers, is PROTECTED by copyrights, trademarks, service marks, patents or other proprietary rights and laws; therefore, User is only permitted to use such content as expressly authorized by the Service or the Advertiser. © 2017 Danilo Torres. All rights reserved.